fresh juniper: Organized Life Free Giveaways Ends Soon - Enter Now! Organized Life Free Giveaways Ends Soon - Enter Now! Wonderful news! 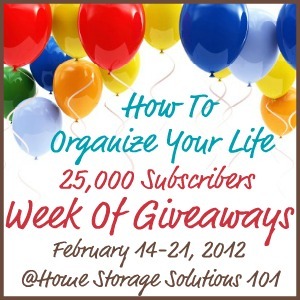 The 52 Week Organized Home Challenge has some wonderful organizing freebies to give away. Hurry, registration is still open for almost everything, there are just a few days left!!! "Family meal planning is such an important part of living an organized life, because eating meals together with your family is such a special and important daily event in our lives. 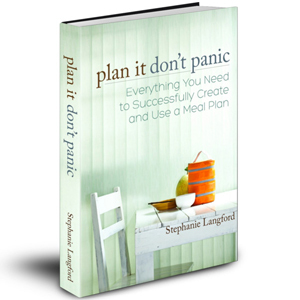 That's why I'm so excited that Stephanie Langford, from Keeper of the Home, has offered to give 10 Home Storage Solutions 101 readers a free copy of her recent ebook, Plan It Don't Panic: Everything You Need to Successfully Create and Use a Meal Plan." Click here to enter the free giveaway for Plan It Don't Panic Hurry, you must register on or before February 23, 2012 to be eligible to win Plan It Don't Panic. "Plan To Eat is an online meal planner resource you can use to handle all the portions of planning your meals, from recipe organization, creating your grocery shopping list, and, of course, planning your menu for the week.Since it can help with so many aspects of the organizing and planning process I'm excited to announce this giveaway of at least 2 annual subscriptions, each worth $39. Plus, everyone can sign up for a 30 day free trial to check it out and see how it works for yourself! I say at least 2 annual subscriptions will be given away because the more entries received, the more subscriptions Plan to Eat will giveaway, so make sure to enter, and tell your friends and family to enter too!" Click here to enter the free giveaway for Plan To Eat Hurry, you must register on or before February 23, 2012 to be eligible to win Plan To Eat. "Personal time management skills are something we all need to work on, especially if we're on a quest to get more organized. That's why I'm pleased that Amy Lynn Andrews is giving away three of her ebooks, Tell Your Time, to Home Storage Solutions 101 readers." 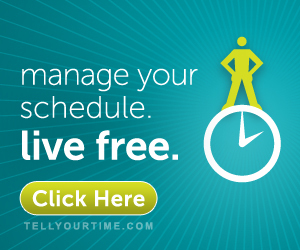 Click here to enter the free eBook giveaway Personal Time Management Skills: Tell Your Time Hurry, you must register on or before February 24, 2012 to be eligible to win Personal Time Management Skills: Tell Your Time eBook. "Naked Binder is a company that believes in organizing, the green way. They make eco friendly recycled binders, tabs, labels, folders, and CD holders. All of their binders are made from 100% recycled board (97% post-consumer waste). In addition, every component in the binders can be recycled again. Finally, not only are the binders designed to be friendly to the Earth, but also are made to last. In fact, the hinges of the binders have been tested to 250,000 flexes. Naked Binder is giving one Home Storage Solutions 101 reader, who enters the giveaway below, a notebook Binder with tab set and a project binder with a round spine in flare red with a tab set, which has a retail value of $25.50." 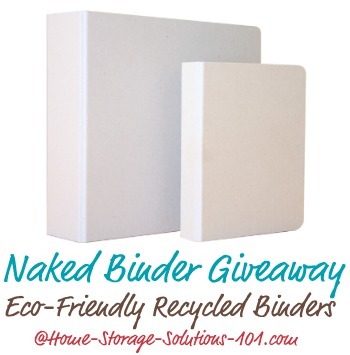 Click here to enter the free giveaway for the Naked Binder Hurry, you must register on or before February 26, 2012 to be eligible to win the Naked Binder. "PearBudget is a really simple online budget software system, using the principle of the envelope system, to help you budget for the future and track where your money really went during the month. Since taking care of your finances is such an important part of an organized life, I'm excited to share that PearBudget is giving away 3 annual subscriptions, worth $49.50 each, to Home Storage Solutions 101 readers. Plus, everyone can sign up for a 30 day free trial to check it out and see how it works for yourself!" Click here to enter the free giveaway for Pear Budget Free Online Software Hurry, you must register on or before February 26, 2012 to be eligible to win the Pear Budget Software. "Rubbermaid Bento Boxes are designed to not only store objects, but to keep the contents organized at the same time. These are a new type of decorative storage boxes that not only look nice in your room, but also have flex dividers within them which allows you to customize the inside of the box, so you can make space for all types of items. That's why I'm excited that for the last day of the How To Organize Your Life Week of Giveaways Rubbermaid has agreed to give one set of these boxes, in the paprika color, to one Home Storage Solutions 101 reader. This prize has a retail value of $113.93." 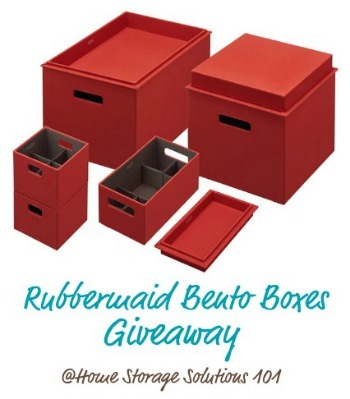 Click here to enter the free giveaway for the Rubbermaid Bento Boxes Hurry, you must register on or before February 26, 2012 to be eligible to win the Rubbermaid Bento Boxes. This is so exciting! Good luck, and PLEASE tell me if you win! Speaking of winners, Taylor is giving away a TON of super organizing freebies to everyone that would like to have these jewels. Click here to go the site and claim your freebies. There is no registration required or any gimmick for these, everyone wins. Your comments are important. Thanks for your input!